My crab is not moving in his shell. My crab had not moved for days from inside the wood piece that we put in his cage. He is in his shell. Everything I see about molting talks about a crab outside of his shell. He has staged in his shell and I know he hasn’t moved. We just got him about 3 weeks ago from one of those terrible hermit crab sellers at the beach. I feel so bad for him because I know he has gone through a lot. We bought two and the other one died (I think) but I wasn’t sure. He kind of smelled but then it said crabs that are molting can smell too. I feel horrible that I can’t help this one. When we first brought him home he was moving around. We had a bad cage for about a week then I moved both crabs into a nice new aquarium with substrate and good food. But both after they moved to the nice home just stopped moving. The one that we have now moved around a little at first but now had just stopped. He hasn’t eaten or drank anything. Not sure what to do. Just leave him in the wood? If he is in the shell not moving, could he be molting or is he just dying? They don't come out of their shells when they molt. It's good he's still in his shell. And usually they dig down to molt, as long as there is enough substrate. How deep is yours? He could be coming out at night to eat and drunk but they eat such tiny amounts you might not notice. If you smooth the sand before you go to bed, you'll see dragmarks in the morning if he comes out. I know it's really hard to know what's really going on. And we get attached so quickly. He is not in the ground he is hiding in a wooden log (got as part of a hermit crab kit). At least I think he is in there. I see his shell but I don’t see him. And I don’t see any track marks around the log. Or around the water or food. Could he be molting in his shell, above ground? Our substrate is about 3 to 4 inches deep. He is a small hermit crab. Now I am worried that the other hermit crab wasn’t dead. I feel horrible. He was also above ground kind of hanging a little out of the shell pressed up against the glass. I could tell he hadn’t moved for a week! Then I decided to pick him up and his big claw was not attached to him. And he smelled a little fishy but not horrendous. I thought because the big claw was off and he smelled that he was dead. Now I am afraid that I am going to make the same mistake with this one. I want to get another hermit crab to keep this one happy but we are going on vacation for a couple weeks. My mom is going to come to the house and change the water and food every couple days. If he does molt, you’ll find the exoskeleton next to him. Surface molts are considered emergency situations and should be taken seriously. If I might ask, what are you using for a substrate? We usually recommend about six inches or three times deeper than the height of the tallest crab to mask their molting scents. Hermit crabs are nocturnal, so maybe yours is coming out of the wood piece at night and returning to it because he likes it a lot. I have nothing else that hasn’t already been stated, so the only thing I can still say is to calm down and give him a week or two to adjust to a new environment. If you are still concerned, you could always take him to the vet. Hope your crab does well! Good luck!! Most vets don’t have quality training with hermit crabs. I’d be surprised if you found one who’s knowledgeable. I know none around here deal with hermit crabs lol...I curiously asked ours while we were chit chatting and he said he wouldn’t know the first thing about them. What kind of substrate are you using? Is it moist? There is almost nothing a vet can do for a hermit crab and most of them aren't even trained or have any actual knowledge of how to care for ceonobita species. 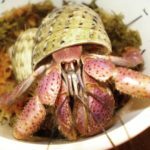 soilentgringa wrote: There is almost nothing a vet can do for a hermit crab and most of them aren't even trained or have any actual knowledge of how to care for ceonobita species.